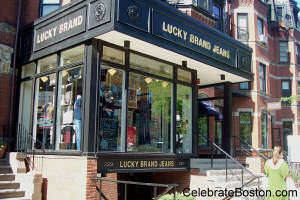 Lucky Brand Jeans has been around for over 20 years, and they've expanded to about 150 company-owned stores in the US and other countries worldwide. Lucky's most famous trademarks are 2 four-leaf clovers and the phrase "Lucky Me!" and "Lucky You!” stitched onto both sides of the inside fly shield of their denim pants. They've developed their products to include a wide variety of jeans, both for men and women, available in different styles, fits and washes, as well as a complete clothing line including men's sweaters, shorts, shirts, jackets and women's dresses, skirts, shorts, tops and even shoes. According to online reviews, this particular store on Newbury Street is relatively small, and shoppers can feel it more during weekends when the store is packed. On the flipside, the store being packed says something about how people like the brand. They've got a huge variety of fits, which makes shopping there a real joy. The salespeople here have been described as great! They're friendly, know their products, and will patiently work with you to get the perfect fit for you, however your body type. It's also great that they're frank and will tell you politely to your face if they think the pair you're trying on doesn't look good on you. Online reviews have repeatedly stated that the staff here are extremely patient—don't worry about having to try on 5 or 10 pairs just to get the perfect one. Along with the great service and excellent products, of course, comes a higher-than-average price tag. The jeans are pricey, ranging from about $100 upwards. One good tip is to buy a relatively inexpensive pair of jeans (that you like and fits ok, of course) and then sign up for their mailing list. This way, they'll be sure to inform you of upcoming sales and great deals which can go all the way to 50% off! Aside from the jeans, some people admit to regularly going here but not making a purchase—they like the trendy apparel designs and especially some of the cool vintage shirts. The clothing can also be a bit pricey for the types of fabrics, but the fit can be amazing. Walking Directions: Exit the station. Walk one block north up Dartmouth Street to Newbury Street. Walk two blocks west on Newbury and Lucky Brand Jeans is located on the right.